AirLink Management Service: "Best in Class"
Our customers are buying Sierra Wireless gateway solutions to support their key business priorities. In the energy industry, these solutions help them manage vital business-critical infrastructure like pipelines or transmission lines. For our enterprise clients, our solutions ensure that retail operations continue even when landlines fail. And our mobile gateways are in vehicles of the nation’s first responders, transit agencies and utility fleets. Given the remote nature of all of these assets, it just makes sense that the IT teams would want to know the status of communications at all these points. AirLink Management Service or ALMS (formerly AirVantage Management Service or AVMS) enables our customers to manage, monitor and maintain gateways remotely. So how does ALMS compare to other vendor gateway management systems? 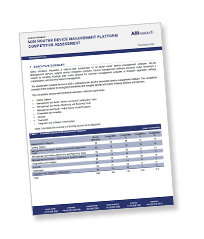 We wanted to know, and commissioned an independent study by ABI Research® to evaluate all the various management systems – from usability through functionality. What did they discover? ALMS is “best in class”. Learn why ALMS is "best in class."